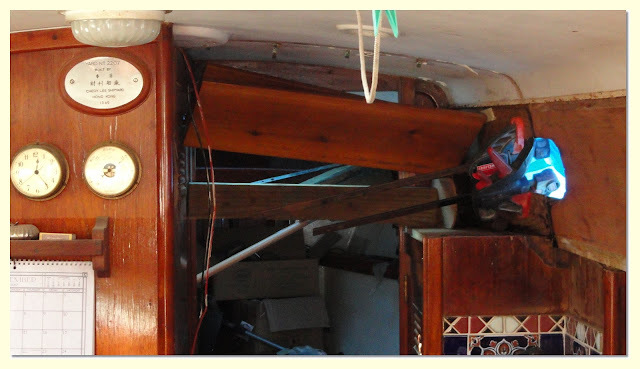 There is a crack in the keel seam between the lead and hull glass. 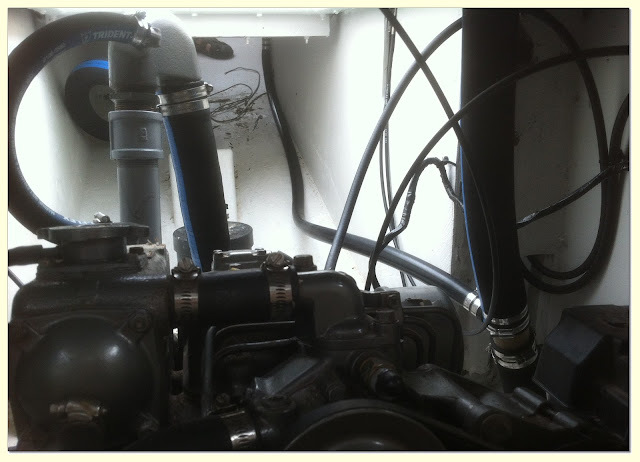 It is below the two keel bolts that always sit in water. Whether on the hard, in the water, rain, shine, there is always water sitting there. It doesn't drain to the bilge properly. We'll fix that shortly, but for now we need to get the outside done. AJ tightened down the keel bolts and sanded the crack in the paint where the keel seam was leaking. 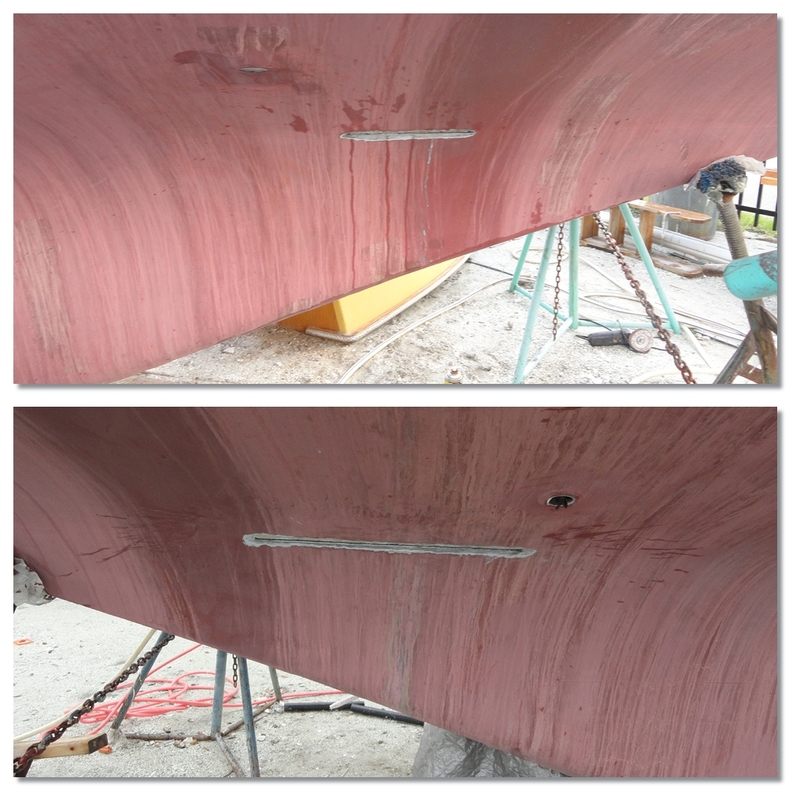 The keel seam was fiberglass taped by a previous owner at some point, and it was cracked when we hauled out, so this appears to have been an ongoing problem. Running out of time we ground back the area, cleared out the old caulk, flattened the tip on the caulk gun and re-filled the seam with 5200 hoping it will allow for flex until we can drop the keel, inspect the bolts, and rebed the whole mess in the far future. It will do for now. I stripped and painted the lockers that house the transducer thru hulls, and batteries. I was planning on using white but we have a gallon of gray bilge coat, so gray it is. 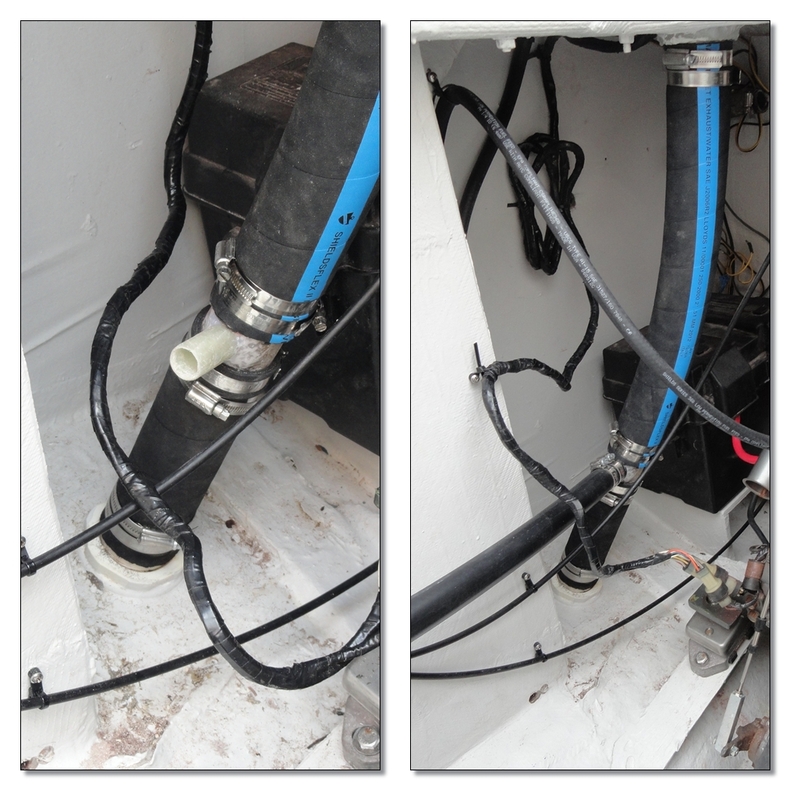 The speed/log transducer is in port side thru hull, depth sounder in the starboard. We have two portlights left to install. They were not done with the others because the wood fascia behind them had to be replaced. We started by epoxying in new solid 3/16" teak fascia head boards on the starboard side above the closet and in the vee berth. They were the only two sections that were still covered in the original Chinese plywood with teak veneer. They were badly delaminated and rotten, so we scraped the coachroof insides clean to the polyester rather easily in that area. 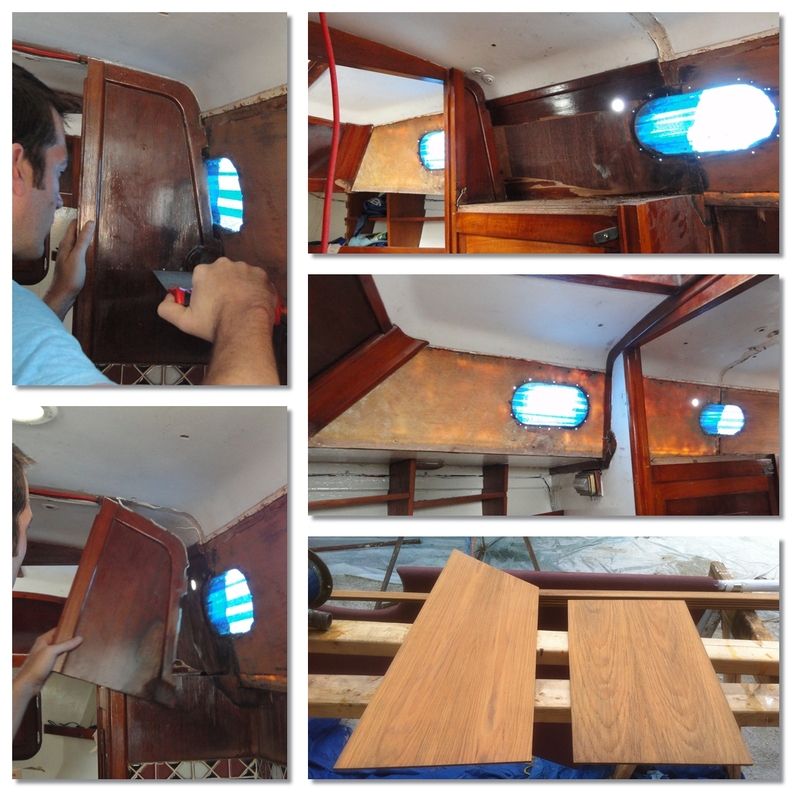 The rest of the cabin has already been very nicely done in solid teak boards instead of plywood. Our local wood guy, Mark, homesteads with his wife, Rose, on their self sustaining farm. When not harvesting eggs, or slaughtering chickens or pigs, they run M.R. Woods in Stuart, FL. They also harvest absolutely the most amazing orange blossom honey. He kindly hand-selected some old growth heart wood teak 6" wide lumber from his stock and sawed off thin boards then edge glued them to get the needed 11" height. This is how the other replacement panels in the cabin were done, but with Mark's panels, the joint is very difficult to find. Primo work, and only $60 for the fascia and 30 feet of teak trim if you can believe it. The $ never gets eaten up where you think they will. It's the soft costs that kill you. Notice that the bulk head splits the window in half. We rectified this by cutting off the top of the bulkhead both so we could access the rotten fascia and so the window can be installed. It will be reinforced across the ceiling to the cabinet bulkhead, but more on that when we get to it. For now the old arrangement must go. AJ cut out a crude oval matching the old portlight so we'd have a way to clamp it down while it cured. 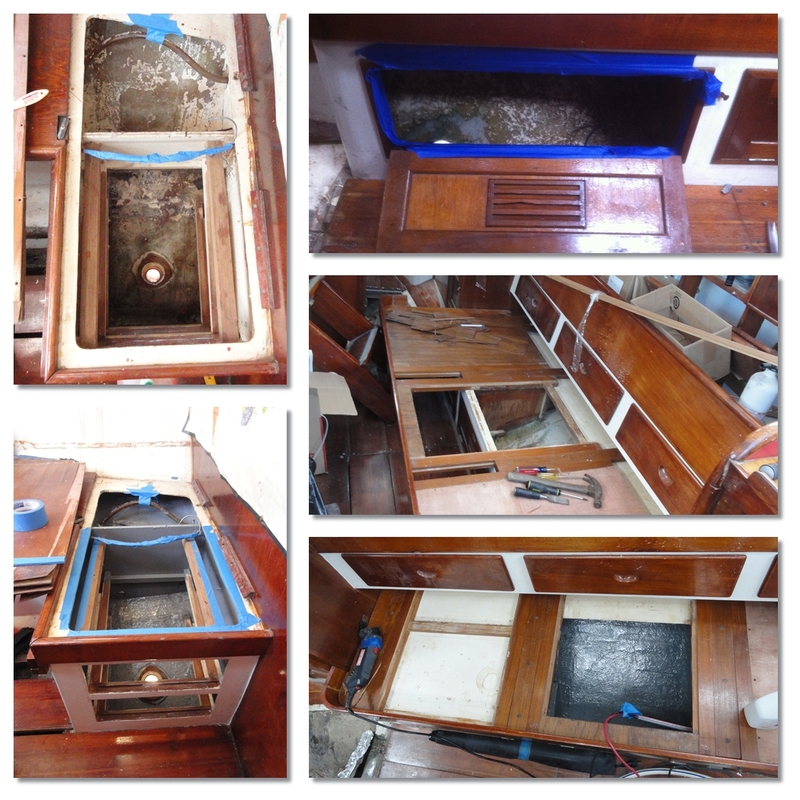 The fascia boards were surprisingly stiff and remained straight while sitting in the boat for the week of rain, but soaking up the epoxy on one side caused them to want to curl once applied the cabin sides, and the clamps weren't enough. We had to improvise something to push them back down before the epoxy cured. We wedged 2 x 4s, paint roller handle extensions, sections of aluminum extrusion, and spare shelves between the cabin sides with plenty of paint stirring sticks to shim it just right. It was tricky. But worked. The back corner drain in the cockpit floor still had to be plumbed. We decided to run it to the large portside drain. AJ spent a lot of time at plumbing and home improvement stores looking for a piece that we could use to plumb the small aft drain into the massive forward ones that we built a few months ago. We could have built something out of hundreds of dollars of large bronze fittings: A 2" Tee; 2x 2" threaded hose barbs; a 2"-1" reducer holding a 1"-3/4" reducer, and a 3/4" barb. Aside from the heavy and expensive chunk of bronze I would have ended up with, it would have had 5 threaded joints, which is to me as good as asking for a leak. Fiberglass/epoxy is quickly becoming our go-to material, so we decided it would be simpler and better to make our own out of lightweight, leakproof, everlasting fiberglass "T" junction. We started with a 2" fiberglass exhaust coupling tube, then drilled a hole and inserted flexible poly tubing of the correct diameter. The correct inside diameter of the drain is the same as the outside diameter of the tubing. Then just wrap the tubing in wet fiberglass (two wraps of biaxial cloth with chopped strand mat = ~ 1/8" thick), feather the wet fiberglass out onto the 2" tube around the junction, and immediately wrap in masking tape to keep it all compressed and smooth as it cures. The key here is that epoxy does not stick to masking tape adhesive nor to the poly tubing, so after it cures, all we had to do is peel the masking tape off and grab the poly tube with some pliers and twist until it came out. Viola: solid cockpit drain tube T junction. 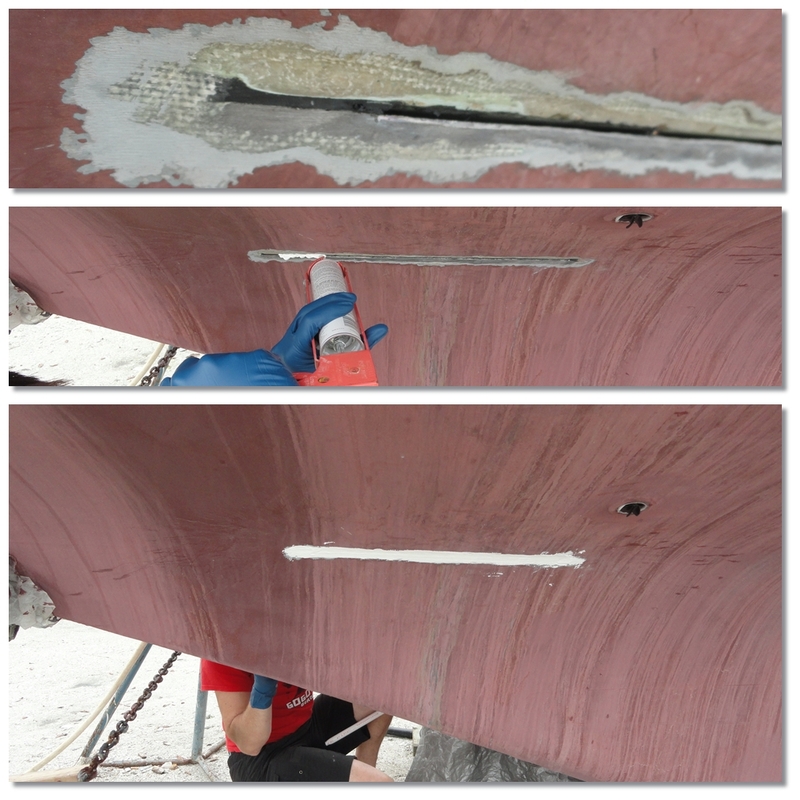 We added some strand thickened epoxy to the joint area afterwards to further reinforce it. I am beginning to love the simplicity of fiberglass... still not liking the raw materials involved. 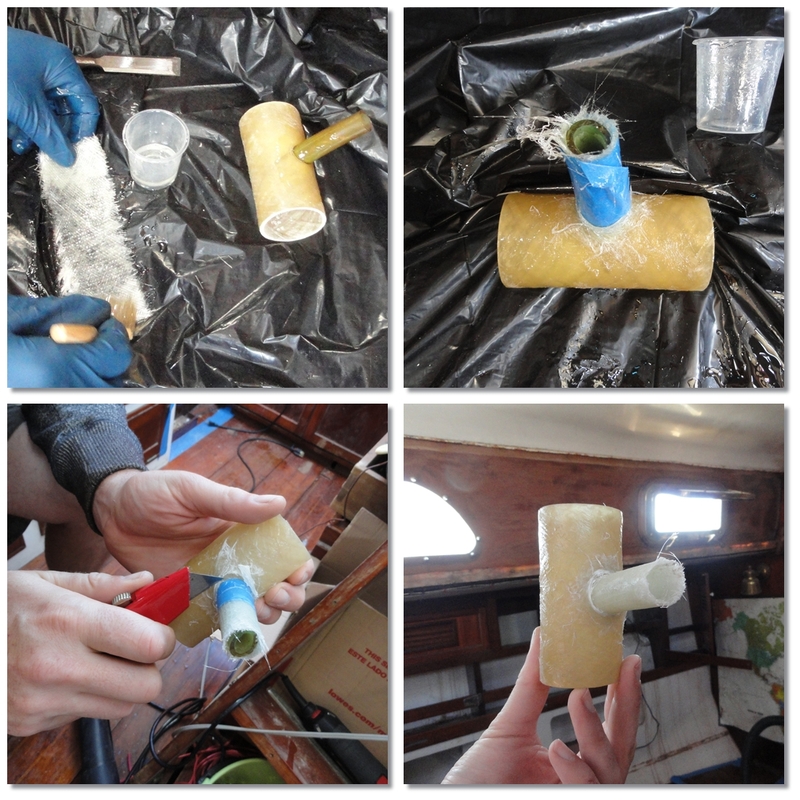 AJ also made the small aft cockpit drain tube this plumbs to in the same manner. We ran into some problems with the prop. We had a nice 3 blade prop, but it didn't fit because it had slightly aft raked blades that hit the rudder. So we put on a 2 blade prop given to us by Lee McGregor, but it hit the rudder too. So we had to cut the shaft just a bit to get it to fit properly. Plus a two blade prop can be removed without lifting the engine to move the shaft forward first. It's now on and ready, we're just waiting on the proper spacer for our drivesaver in order to finalize. We've also installed a lot of the deck hardware, still more to install today. The bilge pump is installed, And many of the new stanchions are standing proud. It's been a little of this and a little of that all over the boat each day trying to get ready. Feels like I'm running in circles! "This rambling propensity strengthened with the years. Books of voyages and travels became my passion, and in devouring their contents, I neglected the regular exercises of the school. How wistfully would I wander about the pier-heads in fine weather, and watch the parting ships, bound to distant climes; with what longing eyes would I gaze after their lessening sails, and waft myself in imagination to the ends of the earth!" Merry Christmas AJ & Sarah! I regularly follow your progress from here in Frankfurt(remember, I've got the same boat blocked ashore stateside). You're doing one heckuva job, that's for sure, and I know all your hard work will and determination is an inspiration for many of us watching from the sidelines.